Beautiful Evangeline ceiling tiles lighten up a dark room. Tiles worked beautifully and transformed a dismal, ordinary room. 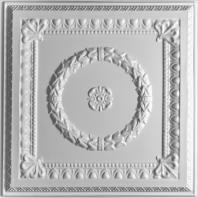 We chose to create a coffered ceiling that is really amazing. Following up with another email to tell you how pleased I am with the way the Ceilume tiles worked for me. The tiles truly appear to be as if they were cast plaster (the effect I had hoped for) and they serve to lighten up a dark room nicely. The coffering was a challenge with each area needing to be adapted to the vagaries of a ceiling created in the 19th century, but it was certainly worth all the measuring, leveling, and finagling we needed to do.